Our gratitude and thanks go out to all the companies and firms who have supplied and provided services to us in the years over the expansion of our business. A heartfelt and special thanks to many hundreds of staff that have worked in various parts of our complex in the past 34 years. The present staff who are staying with the new owners will play a major part in the continuing success of the island complex. The family will sadly miss each and every one of them. We would also like to thank the local business community who have supported us over the years and all the Kirklees Metropolitan Council Agencies that we have always worked very closely with. Our thanks are also extended to all members past and present of the West Yorkshire Police Department, West Yorkshire Fire Brigade and West Yorkshire Ambulance Service for all their hard work, support and advice. To all the many thousands of customers, friends and members (in some cases three generations), thank you all. Without you it would not have been possible to restore the whole island complex from the blighted buildings in 1969 to renovated listed grade 2 buildings, which we have restored over the years. We wish everyone to know that after the takeover the family will always be able to be contacted at Huddersfield Central Lodge which together with our car park situated in the Beast Market and other town centre properties are still owned by the family. A special thanks to Mr Robert Turner, of Armitage Sykes, Mr Chris Fieldhouse, of Pattimore & Dyson, Mrs Christine Charlesworth, of Jardine Lloyd Thompson, and Mr Alan Hind, of Barclays Corporate Sector and all their teams. With regard to the complex, although contracts have been exchanged, the family are still in complete charge and will be until completion in approximately two weeks time. The final party night will be announced in the next few days, check Stop Press for details. Once again a great big thank you to everyone. 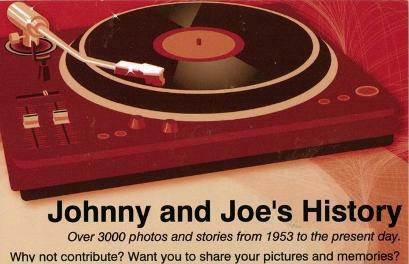 Fact One: In 1969 Johnny's brother, Joe joined Johnny at the Old Bull's Head, Beast Market. This was then an empty and derelict pub which, Johnny and Joe converted into Johnny's Nightclub, opening in December 1969. 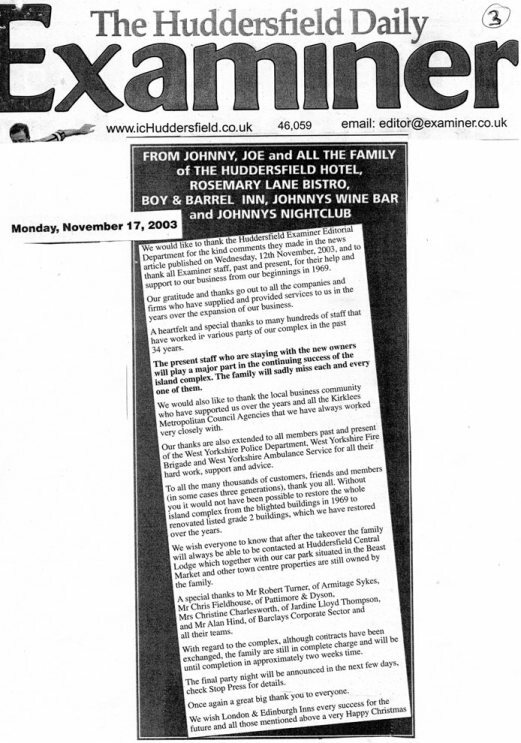 Fact Two: By 1999 the brothers had purchased, re-developed and opened the entire island complex consisting of the nightclub, Johnny's Winebar, The Palace Brasserie, The Boy and Barrel Inn, The Rosemary Lane Bistro and the Huddersfield Hotel. All sections of the business enjoyed tremendous success, throughout the decades. Fact Three: After 34 years of owning and running the Island Complex, no part of the business or property were for sale in any way although various property agents, national brewers and hotel chains made several unsolicited approaches. All offers were rejected by John and Joe. Fact Four: In early 2003, Joe was approached by London and Edinburgh Inns with an offer for all of the Island site. As a result of this meeting and after several months of negotations the family agreed to accept a substantial sum for the sale of the Island property and business. The family felt that after 34 years they had achieved everything all they had hoped to do and now was the right time to enjoy a new life. They will always be grateful to the people of Huddersfield and beyond for their support over the years. The sale was completed on November 28th 2003. Fact Five: Johnny and Joe have not sold any of their other properties or any other companies controlled by Johnny and Joe. 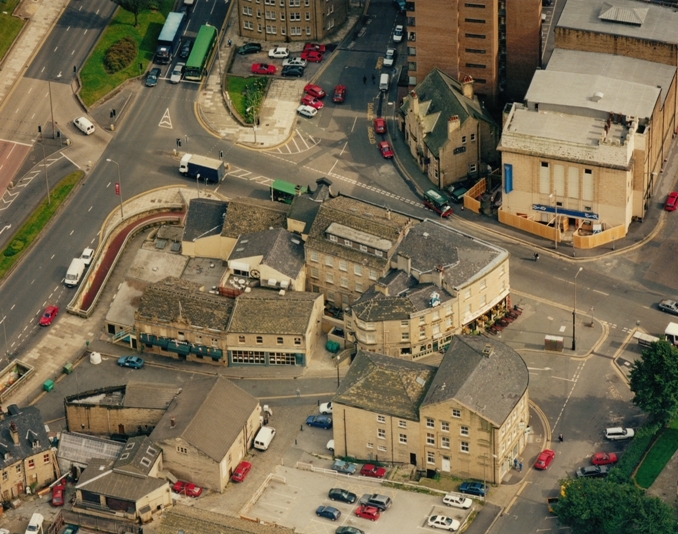 These properties include much of the south side of the Beast Market, The Old Top Ten Night Club, the Southgate Mews, the 50+ space private secure car park or the Huddersfield Central Lodge. Although Johnny and Joe are now in semi-retirement they are still actively involved in the day to day running of their remaining businesses. Thirty years of dance, romance and fun! No-one who grew up in Huddersfield over the past 30 years can have missed out on a night at Johnny’s. The nightclub tucked away at the bottom of Beast Market has been a magnet for party-goers and night owls of all ages. And although clubs have come and gone over the past decades, Johnny’s has been, well, Johnny’s. Now, one era has ended and another is about to start. Johnny and Joe Marsden, the brothers who have run the club together since a December night in 1969, signed on the dotted line today. The club, along with the rest of the bars and restaurants in the Huddersfield Hotel complex, has been sold. The new owners, London and Edinburgh Inns, have promised no changes. Their executives have been in Johnny’s night after night – all in the name of business of course – and pledged there would be no changes. So the polished metal dance floor stays, as does the karaoke bar, the cloakrooms tucked away at the top of the stairs and the quiet corners where many a romance was kindled. Johnny’s flourished in the 1970’s when disco fever was at its height. Hot sweaty nights in a club packed with hundreds of dancers were a memory to live long for many. So, too were the crocodiles of young men, a drink in their hand, weaving their way round and round, eyeing up the gaggles of giggling girls dancing round handbags. The club with its collection of bars – including one in a phone kiosk – has played host to the rich and the famous. TV and film stars who have stayed at The Huddersfield Hotel have been regular visitors over the years. Many of the cast of TV hits like Last Of The Summer Wine and Where The Heart Is are on first-name terms with staff, many of whom have been there for years. But it is the ordinary punters who have made Johnny’s what it is. Countless of us have celebrated birthdays, stag nights, weddings and Christmas bops on the dance floor and got noisily merry. And across Huddersfield there must be many couples whose first romantic dates were played out beneath the throbbing beat of a bass-heavy disco and the ubiquitous smoke machine. He recalled how, aged just nine, he sat under a trestle table in a marquee in Well-holme Park, Brighouse, helping his mum and dad on Coronation Day. Joe and Delia Marsden were catering for a Coronation party – and Johnny’s job was to work the stirrup pump to keep the tea urns warm. He left school at 14 to work briefly as a paint sprayer at Appleyards Garage. But he then began in the entertainment business, running a club in the cellars of his father’s Top Ten Club in Southgate. And it was he who turned down a little-known band in the early 1960s. The club played host to bands every Friday night and an agent offered to bring a band from Bradford University after their gig. They were playing a spot at the University and offered to do a second gig in Huddersfield. The price was £20 – but Johnny was adamant: No more than £18. He stuck to his guns and the band stuck to their price. So Huddersfield fans missed a chance to see a young singer called Mick Jagger and his band, The Rolling Stones. A dynasty in the Huddersfield entertainment world ended today. Brothers Johnny and Joe Marsden have sold their hotel, club and restaurant complex in the heart of the town centre – ending a link stretching back 34 years. They have sold The Huddersfield Hotel, the Boy and Barrel pub, The Palace Bar, The Rosemary Lane Bistro and the famous Johnny’s nightclub to a national hotel chain. But they did so with a promise to them that the businesses they had founded would continue and that the 90 jobs would remain. The Marsden brothers, together with their 84-old mother, Delia, have been involved in the leisure and service industry in Huddersfield for half a century. It was back in 1953 that Mrs Marsden and her late husband, Joe, set up a transport café in Southgate –right on the old A62 trans-Pennine route which preceded the M62. It was across the road from a patch of wasteland described as “England’s biggest lorry park”. And their business thrived, as they tempted scores of drivers to stop in Huddersfield for dinner, bed and breakfast, with a hot shower, for 12shillings (60p). But it was in 1969 that the brothers went into business themselves. They acquired the former Bull’s Head pub in Beast Market and opened it as a nightclub called Johnny’s. It was the start of an entertainment complex on an “island” surrounded by Beast Market, Kirkgate and Southgate that was today sold to the London and Edinburgh Inns Group. A deal was signed early today in the three-star Huddersfield Hotel and the brothers moved into semi-retirement. They have retained the Huddersfield Central Lodge Hotel, with 22 bedrooms, in Beast Market, and also own several commercial properties in the town centre. The business has changed hands for a substantial sum and the new owners want to keep the restaurant, hotel and club going. Joe Marsden said: “There are two main reasons why we have decided to move. “We have been approached many times over the years by people wanting to buy us out, but all wanted to change things. “Myself, my wife, Janice, Johnny, his partner (now wife), Angela, and our mother Delia talked about it and decided there was nothing else we could do with the site. “We have acquired it all over the years and converted many fine buildings and expanded the various businesses into the properties they bought. Huddersfield has been very good to us and I believe we have contributed a lot to the town, in terms of providing jobs and keeping old buildings. Peter Gray, chief executive of London and Edinburgh’s hotels division, said: “We started talking to Joe and Johnny some months ago and they are wonderful people. Our ethos is to take over successful businesses and keep them going, hopefully without people realising there has been a change. “There are no plans to change what we have acquired in Huddersfield. We do not mess with things that work.” The company owns 250 tenanted pubs, 100 managed pubs and about 50 hotels, with some 2,500 beds. The latest buy was the 13-strong Swallow Hotels chain.